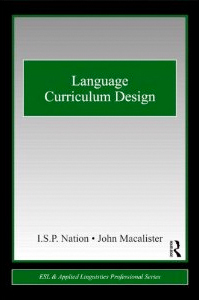 Curriculum, or course, design is largely a 'how-to-do-it' activity that involves the integration of knowledge from many of the areas in the field of Applied Linguistics, such as language acquisition research, teaching methodology, assessment, language description, and materials production. Combining sound research/theory with state-of-the-art practice, Language Curriculum Design is widely applicable for ESL/EFL language education courses around the world. Plus additional readings as indicated below. Each week you are required to complete a number of assignment tasks. A few years ago, foreign language instruction in the United Kingdom was extensively reviewed and major changes resulted. For this assignment you will first read the key report, called the ‘Languages Review’, published in 2007 by the Department for Education and Skills, and then respond to the scenario and questions below. how do the recommendations in the Review affect the curriculum? how does it affect your students’ needs? Changes (if any) to the curriculum and the rationale for these changes. Any follow up consultations, reviews and research you think should be undertaken, and what these should accomplish. Your report should be between 1000-1250 words long. You should use the terminology used in the course up to this point. You can make some assumptions in your report about the school, e.g. about the number of students, the number of languages, etc. Due at the end of Week 4. Option 1 Review an existing course in an institution you are familiar with, taking into account the principles and issues we have examined during the course. Your review should be 3,000-4,000 words long, excluding samples taken from the course. Their needs are therefore quite different from most international students who come from EFL backgrounds. Nonetheless, their English needs are considerable as many have little or no experience with academic language use, and little or no support at home with this. There is a danger that support classes could be seen as stigmatising. Due one week after the final lecture. At the end of each week the class meets online in real time. Classes are 90 minutes long; the first hour is professor-led discussion and the last 30 minutes is student-led discussion. Participation is mandatory and counts toward your grade. Real time online class time: Fridays from 5:00pm - 6:30pm - California time. Please consult www.timezoneconverter.com for the correct time for your area.